Congratulations to Leisa Cass who became a member of the Million Metres Club in December 2014. Leisa was presented with the award at the NSW State Long Course Championships on 21 March 2015. 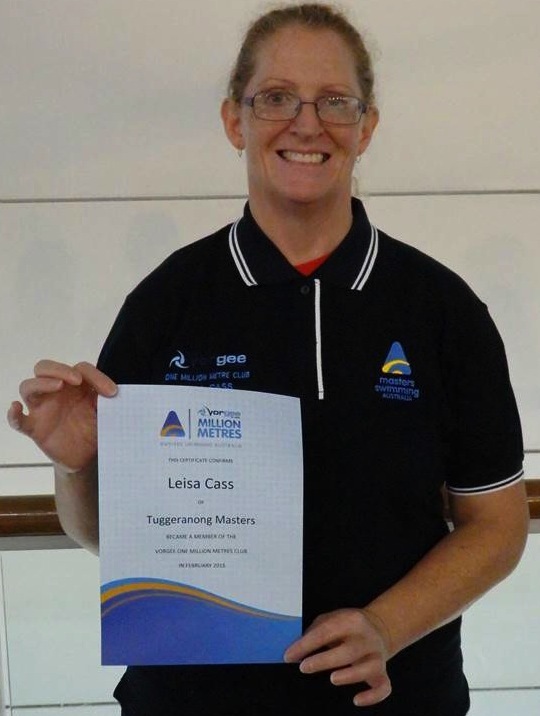 Leisa joined Masters swimming in 2004 after hearing about the swimming at the Australian Masters Games that were held in Canberra in late 2003. She only trained once or sometimes twice a week for the first couple of years, and didn’t compete. She didn’t know anything about the million metres program or really know about or participate in the Endurance program either. In early 2011, after about seven years of swimming (and probably at least one million metres! ), Leisa decided to start counting towards her first ‘official’ one million metres. She wasn’t sure how long it would take, but decided that less than five years would be a good target. Three years and nine months later she was done – averaging just over 22km per month, with a low point of just 1.8km one month and a high of 42km another month. …if you are new to the club, why not start logging all the swims you do at training and in endurance and race meets. All of these count towards your Vorgee Million Metres Awards which are open to all registered members of Masters Swimming Australia and are intended to stimulate members to strive for greater fitness.